India has been a prey to rising tide of non-communicable diseases. It is becoming increasingly important to evolve strategies to ensure effective prevention, diagnosis and treatment of this rising burden. Available Indian data reveal different opinions regarding type 1 diabetes (T1D). Such variation in data leads to uncertainty in healthcare planning and management. This ununiformity in data and the absence of protocol make a task challenging. Many patients consult non-specialists and even doctors from different streams. On the part of the patients, the diagnostic and screening testing are a great burden. T1D registry is of great relevance to India. It helps in ensuring good clinical practice and errors. Endocrinologists and paediatricians can audit themselves using such a registry. The overall goal is to improve population health. The objective is to reduce morbidity and mortality while maximising the cost-effectiveness. Such a registry helps in fund allocation and healthcare planning and contributes to the formulation of pragmatic management guidelines. However, healthcare professionals are reluctant to share their data. This may be due to fear of being audited by peers or regulators and record maintenance. We must work towards creating a national registry of T1D. This should involve multiple centres across the country, as it will help enhance awareness about T1D and improve standard of care. The results of which can be used to advocate for greater allocation of resources to T1D care. An effective registry will help children claim their rightful place under the sun. While developing countries continue to fight against infectious diseases, they are increasingly falling prey to a rising tide of non-communicable diseases (NCDs). With health systems ill-equipped to manage chronic diseases effectively, there is growing pressure to rethink the allocation of resources for health. It is becoming increasingly important to evolve strategies to ensure the effective prevention, diagnosis and treatment of the rising NCD burden. 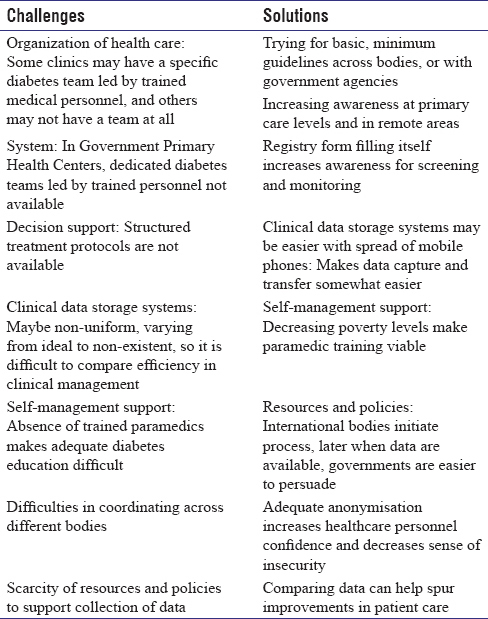 However, this cannot be done if data are not available to support demands for NCD care. Available Indian data suggest widely varying prevalence of type 1 diabetes (T1D) in the country. While Chennai reported 3.2 cases/100,000 children some decades ago, Karnataka recorded 17.93 cases/100,000 children and Karnal in Haryana 10.2 cases/100,000 children in more recent reports.,, According to the International Diabetes Federation, India adds three new cases of T1D/100,000 children aged <14 years, every year. Such variation in data leads to uncertainty in healthcare planning and health system management. There is the absence of uniform guidelines/protocols, in spite of a multiplicity of bodies (e.g., Indian Association of Pediatrics, Endocrine Society of India, Indian Society for Pediatric and Adolescent Endocrinology, Diabetes India, Research Society for the Study of Diabetes in India). The concept of data collection by healthcare providers is not widespread in India. Furthermore, many patients consult general physicians or internists or non-specialist paediatricians for treatment, and doctor-shopping is common. Patients often consult more than one healthcare professional and more than one stream of medicine (Ayurveda/Homeopathy/Unani). Since healthcare is paid out-of-pocket by patients, diagnostic and screening testing for auto-antibodies, genotyping or even basic C-peptide is difficult/impossible for the majority of our patients. This confusion can be resolved by a registry. A registry is an organised system that uses observational study methods to collect uniform data (clinical and other), to evaluate specified outcomes for a population, defined by a particular disease or condition, which serves one or more predetermined scientific, clinical or policy purposes. A population-based registry contains records for people who reside in a defined geographic region (state, country or continent). Availability – there is neither time nor money in the world to fund enough randomised effectiveness studies needed for current decision-making. Whether to use registries for these purposes depends on the validity and reliability of collected information. A good registry should be useful at the clinic and/or population level. It should lead to improvement in care delivery and outcomes for people with a given disease. Compilation can be done from either paper and/or electronic medical records. Inclusion of background characteristics, illness data, treatment, specialty care, patient demographics, practice, clinic and other administrative identifiers is important. Measures to ensure accuracy and completeness of data, and removal of duplicates, are also crucial. A T1D registry is of great relevance to India and other developing countries. It would help in recognising the burden of disease, planning health care, allotting resources, formulating pragmatic management guidelines, improving clinical practice and reducing errors. Paediatric endocrinologists, endocrinologists and paediatricians (who see the major chunk of children with diabetes) can audit themselves using such a registry. The overall goal is to improve population health by tracking key indicators such as medication use, growth and development, co-morbidities and complications. The overall objective is to reduce morbidity and mortality while maximising the cost-effectiveness of diabetes care: This is important for developed countries as well. There is, however, reluctance amongst healthcare professionals to share data. This may be because of poor or incomplete record maintenance or fear of being judged by peers or regulators and found wanting. Fear of legal or social action may contribute to this reluctance as well. Other concerns may relate to anonymisation and data protection, financial liability and competing priorities. Collection of data is very likely to be affected by referral bias; thus, gestational diabetes or T2D may be missed to a lesser or greater degree. Follow-up for data and for complications is patchy. The diagnostic criteria were primarily clinical. Many children continue to be seen by 'adult diabetologists' and physicians in India, so numbers and data may be even patchier than thought. Some co-morbidities and complications may be getting missed, since tests are usually paid for out-of-pocket by patients and may not always be afforded by the family. The challenges and the solutions have been tabulated in [Table 1]. India does have a history of successful registries like the Indian Council of Medical Research (ICMR) Cancer Registry, the ICMR Young Diabetes Registry (YDR),, the Chronic Kidney Disease (CKD) Registry and the Hemophilia registry. These are examples where the registries which have been able to make a mark on government policies including allocation of health resources across different regions of the country, training of different healthcare professionals for the disease and improvement in the quality of care of the patients. The ICMR YDR registry, established by ICMR in 2006 to collect data on diabetes with onset at age <25 years, is huge. Its initial aim was to get an idea of incidence and prevalence of the problem in India. It was soon realised that since complete data would not be possible to capture and the denominator was not available, this could not be estimated. Therefore, the aim was modified to collect information on the status of youth-onset diabetes in India. The objectives now are to generate information on types of youth-onset diabetes, capture geographical variations within India and estimate the burden of diabetes complications. The management of the registry is by ICMR, while data analysis and training are being done by AIIMS, New Delhi. There are eight main centres, with a total of 205 subcentres collaborating. The registry data suggest that the incidence of diabetes in the young is likely to be much higher than anticipated. It also showed a very high percentage of type 2 diabetes (T2D) in young persons. It was able to capture and confirm major regional differences in type of diabetes, for example, almost exclusively T1D in the north, about a quarter being T2D in the south and a significant proportion being pancreatic diabetes in the east. It also indicated a possible need for greater genetic analysis for possible maturity-onset diabetes of the young MODY. Not acting is not a solution. What we must work towards is creating a national registry of diabetes in the young, involving multiple centres across the country, including a variety of healthcare systems and diabetes care providers. The formation of the registry will help enhance awareness about diabetes in the young and likely improve standards of care. Results from the registry can be used to advocate for greater allocation of resources to youth-onset diabetes care. An effective registry will help children living with diabetes claim their rightful place under the sun. Koopman JJ, van Bodegom D, Ziem JB, Westendorp RG. An emerging epidemic of noncommunicable diseases in developing populations due to a triple evolutionary mismatch. Am J Trop Med Hyg 2016;94:1189-92. Ramachandran A, Snehalatha C, Krishnaswamy CV. Incidence of IDDM in children in urban population in Southern India. Madras IDDM registry group Madras, South India. Diabetes Res Clin Pract 1996;34:79-82. Kalra S, Kalra B, Sharma A. Prevalence of type 1 diabetes mellitus in Karnal district, Haryana state, India. Diabetol Metab Syndr 2010;2:14. Aguiree F, Brown A, Cho NH, Dahlquist G, Dodd S, Dunning T, et al. IDF Diabetes Atlas. 6th ed. Brussels, Belgium: International Diabetes Federation; 2013. List of Registries. Available from: https://www.nih.gov/health-information/nih-clinical-research-trials-you/list-registries. [Last accessed on 2017 Dec 28]. Bashar A. Incidence and pattern of childhood cancers in India: Findings from population-based cancer registries. Indian J Cancer 2016;53:511-2. Praveen PA, Madhu SV, Mohan V, Das S, Kakati S, Shah N, et al. Registry of youth onset diabetes in India (YDR): Rationale, recruitment, and current status. J Diabetes Sci Technol 2016;10:1034-41. Das AK. Type 1 diabetes in India: Overall insights. Indian J Endocrinol Metab 2015;19:S31-3. Ghosh K, Shetty S, Sahu D. Haemophilia care in India: Innovations and integrations by various chapters of haemophilia federation of India (HFI). Haemophilia 2010;16:61-5.